ORIENT PUBLICATION: SUMMERSLAM® JUST GOT BIGGER! STAMFORD, Conn., July 27, 2015 – WWE (NYSE: WWE) announced today thatSummerSlam will expand from a three-hour show to a four-hour telecast live on WWE Network and now begin at 7pm ET on Sunday, August 23. SummerSlamjoins WWE’s annual pop-culture extravaganza, WrestleMania®, as the only two events with four hours of live non-stop action. 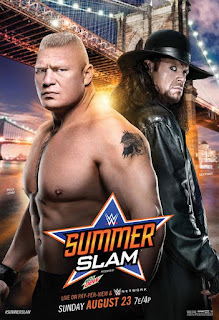 Emanating live from a sold-out Barclays Center in Brooklyn, NY, SummerSlamwill feature WWE Superstars Undertaker® and Brock Lesnar® in a rematch of their historic WrestleMania 30 bout where Lesnar ended Undertaker’s undefeated streak. In addition, WWE Network will also air a one-hour live SummerSlam Kick-Off Show starting at 6pm ET. WWE Network is the only place to get all 12 WWE pay-per-views LIVE at no additional cost, exclusive original programming, and the most comprehensive video-on-demand library with more than 3,300 hours of content, including every WWE, WCW and ECW pay-per-view. Like other digital subscription services, such as Netflix and Hulu, fans are able to sign up for WWE Network online by going to WWENetwork.com, and can watch WWE Network on their TVs through connected devices such as Sony PlayStation 3, Sony PlayStation 4, Xbox One, Xbox 360, Amazon Fire TV, Apple TV and Roku streaming devices as well as Smart TVs including Sony and Samsung. WWE Network is available in more than 175 countries and territories, and reached 1.3 million subscribers as of March 31, 2015. Additional information on WWE (NYSE: WWE) can be found at wwe.com andcorporate.wwe.com. For information on our global activities, go tohttp://www.wwe.com/worldwide/.